The pulley is a simple machine which changes the direction of the force. A pulley uses a wheel, usually with a groove along its middle, and is used for lifting. A rope goes over and around a pulley. Some pulleys have multiple wheels, making them able to lift very heavy loads. Here is Energy Fred using a pulley to rescue toy people in a toy bus from the back of our sofa. The pulley is attached to a beam in our living room. The pulley changes the direction of the force. As Energy Fred pulls down, the bus goes up. The top pulley has double wheels. All this looping around between pulleys means less force can be applied to lift a heavy object. 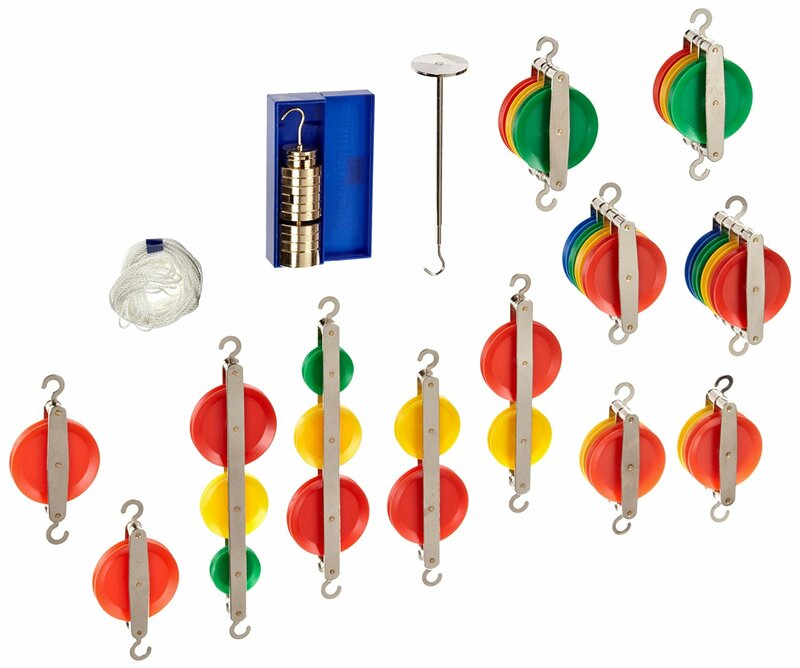 The American Educational 7-1607 Pulley Kit demonstrates principles of physics including mechanical advantage in lifting, applying force, and transmitting power for students in grades 8-12. It includes string, weights, and a variety of pulleys in single, double, triple, and tandem configurations. The plastic wheels are color coded according to size for identification. A pulley is a wheel with a groove along its edge, for holding a rope or cable. Pulleys are usually used in sets designed to reduce the amount of force needed to lift a load. However, the same amount of work is necessary for the load to reach the same height as it would without the pulleys. The magnitude of the force is reduced, but it must act through a longer distance. Pulleys are usually considered one of the simple machines. You’ve probably seen those amazing TV strongmen who can pull cars with their hair and drag trains with their teeth. But did you know science can make you strong too? If you need to lift huge weights, don’t strain your back: use the power of science—and an amazing device called a pulley. Let’s take a closer look at how they work! In the following math applet, change the radius of each pulley and observe the effect on the linear velocity of the belt and the angular velocity of each pulley. Click the “Start” button to begin the animation. Engineers are experts at exploiting the advantages of simple machines in all sorts of real-world applications that benefit society. They incorporate the mechanical advantage of pulleys into their design of many modern-day structures, machines, products and tools, such as cranes, elevators, flagpoles, zip lines, motors, bicycle rings/chains, clothes lines, water well bucket/rope, rock climbing devices, window blinds and sail/fishing boats. Using multiple pulleys in conjunction with motors and electronics, engineers create complex modern devices that perform much work for very little power.